This is the ultimate winter adventure – an 850 kilometre circular expedition through spectacular wild forests and frozen landscapes of Ontario by snowmobile!! Ontario has the largest, and possibly the best, snowmobile trail system in the world, and we will be taking full advantage of it. 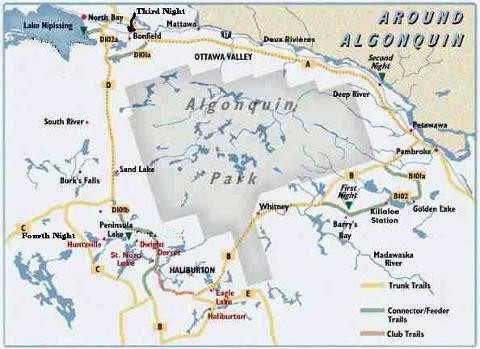 We will explore the extensive network of wilderness snowmobile trails and logging roads as we snowmobile Round Algonquin Park (RAP ride). Our adventure will lead us along snowmobile trails that cut through thick, untamed forests, zoom down a 30 m wide Hydro cut, and take us into quaint little country villages. 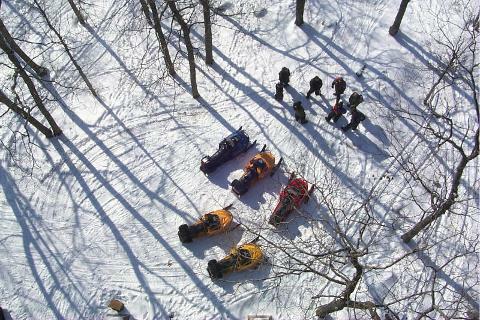 Along the way we will stop our sleds at spectacular vantage points and scenic lookouts. 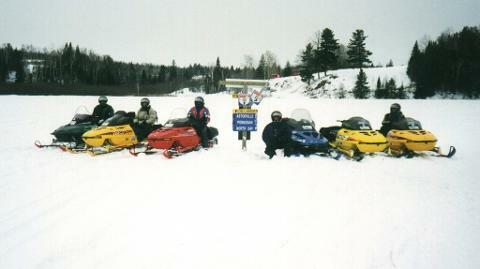 This trip can be done in 3-4 days of “hard” snowmobile riding, but we plan to do it in a more leisurely 5 full days. We will snowmobile between 175 – 250 km each day (6 – 9 hours) before arriving at our resort or motel for the evening (one has a hot tub so bring your bathing suit!). We meet in the Haliburton Highlands at 1 pm. This part of Ontario has some of the best snowmobile trails in the world. They are well groomed, uncrowded, and scenic. You will be outfitted with any needed winter clothing and a helmet, and then we go over the snowmobile controls and basic riding techniques. Our first day of snowmobiling is a relatively easy day, covering only 120 km. This allows you to become familiar with the snowmobiles; how to lean into the corners, where to put your body when braking. We snowmobile through some very beautiful countryside and end up at a lodge deep in the forests for the night. There is a hot tub there, which will be a welcome treat after your first day on the snowmobile trails. An early start will be needed today, as we have a lot of territory to snowmobile over (about 190 km). We will snowmobile by Pembroke and continue on to Rolphton (on the shores of the mighty Ottawa River), where we will be staying at a local motel. Along the way the countryside changes from the dense forests of Algonquin Park to the scenic rolling hills of the Madawaska Valley, giving us many beautiful views of the surrounding uplands. Beyond Pembroke the snowmobile trail follows a Hydro Line forest cut. This 30 m wide strip through the forest will allow us to pick up speed and watch the kilometres just sail by! We are now riding our snowmobiles in the scarcely populated area to the north of Algonquin Park. 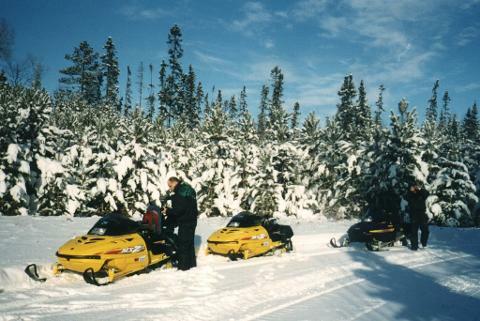 This will also be another long ride, as we must snowmobile about 230 km of forest trail. For many people this is their favourite part of the RAP. A portion of the trail follows a pipeline where the trails are groomed double wide. A great section of snowmobile trail to open up the throttle and test your mettle. There are also quite long stretches of twisty forest trail, and also some scenic lookouts where we can stop for photos. We end our day in North Bay. The accommodation is a hotel/resort that is comfortable and has it's own pub. After a long day on the snowmobile trail, and dinner in the pub, you'll appreciate a good nights rest. We are now snowmobiling south, along the west side of Algonquin. We travel 165 km through the edge of Muskoka, as we snowmobile into Huntsville. While the distance is shorter, the trails are a bit more technical (meaning more twisties!). Also, this is the most populated section of the tour that we will be sledding, so we need to be vigilant for oncoming snowmobiles. We now snowmobile through Muskoka heading back into Haliburton. Depending on ice conditions there are a couple of short cut trails we can take across frozen lakes. These trails are not groomed by the big groomers, but they are staked and quite safe. And, there is no speed limit. So a final chance to get as much fun as you can handle! Eventually, after 125 km of fantastic snowmobiling, we return to the Haliburton Highlands, where we will drop off our snowmobiles. We should get back to our starting point around 3pm, leaving you enough time to get back to Toronto for the evening. We have scheduled trips, but, if you have a group, pick your date! Transportation from Toronto can be arranged.